18,27 & 45 X 30" engine. 11'X 11", 175# steam, boilers. 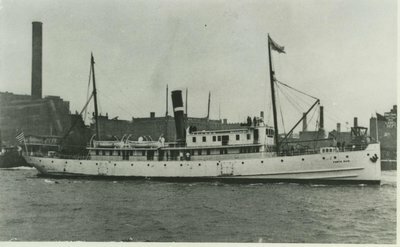 1899, Oct Launched, coastal service around Porto Rico. 1915 Owned New York & Baltimore Transportation Co., New York, NY. 1915 Owned Bluefields Transpotation Co., New York. 1916 Owned A. Chiris, Nantes, France; renamed NICARAGUAN; tonnage change 1023 gross / 679 net tons. 1925 Owned I.V. Vlachakis, Piraeus, Greece; renamed ARISTIDE; tonnage change 1187 gross / 680 net tons. 1926 Owned Athanassoula, Freres, Piraeus, Greece. 1928 Owned Thermalika Steam Navigation Co., Piraeus, Greece; renamed DANAE.